This week we had a rare day when your other Auntie and Uncle were off work, so we all went for a little walk and lunch by the river..You had a lovely time watching your Uncle skim stones and then we headed off to see the ducks. Here you both are watching the ducks together..
Nanny is your bigger Auntie, and you don't get to see her as often as your littler Auntie but you love it when you do. She is the more serious one. You took a while to work her out but now you seem to trust her...When she talks to you, you listen intently and try to tell her things. She is the one that tells you stories, the one who always has something interesting in her bag, the one who always scoops you up and gives your face a wipe, the one who loves to buy you and your little uncle presents. She is the adventurous one, the one who always tells mum not to worry, but still worries about you..
My cuddly little fox and my beautiful, strong Nanny. 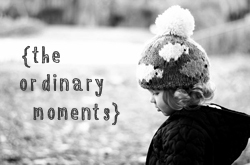 An ordinary moment in our week - that I don't want to forget. 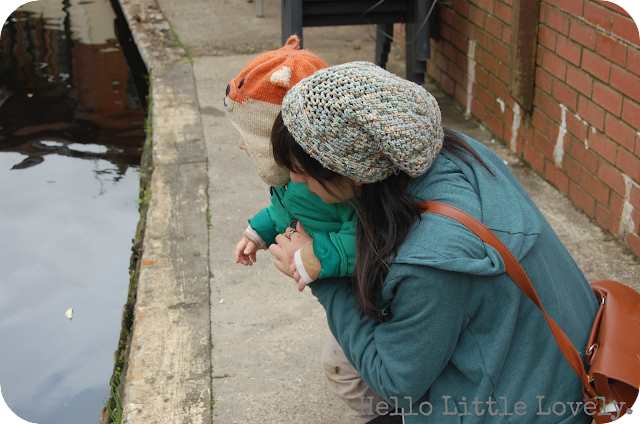 how lovely this little post is and i adore the fox hat!! Oh that fox hat is just adorable! Going to visit the ducks is such a childhood staple isn't it and I don't know about you but I find it really soothing as an adult; I can't come up with a good reason why I ever stopped!